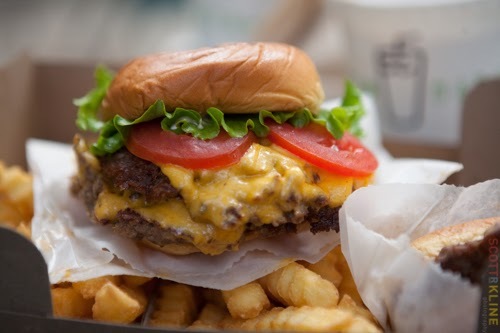 Double Shack Burger at Shake Shack in Manhatten's Madison Square Park. 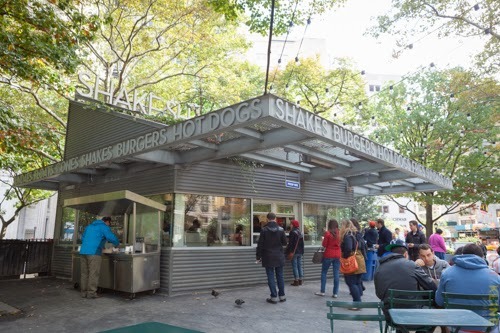 Shake Shack in Madison Square Park is the original location for this New York City icon. When in New York I felt compelled to give it a try. On a lovely fall Sunday in the shadow of the Flatiron Building, the line at noon was only about 5 minutes. I ordered a double Shack Burger ($7.20) fries ($2.70) and a chocolate shake ($5). Pat ordered a plain cheeseburger. We grabbed an outdoor table and waited with our pager. It only took about 5 more minutes to get our food. The burger is special. The two patties were fresh and lightly compacted. There was lots of room for the juice to flow. The meat was salty to the best degree and cooked a perfect medium. Melted American cheese oozed nicely blending with the mayo-based sauce. A couple of firm tomato slices and some fresh green leaf lettuce topped it off. The hinged bun was toasted and spongey, holding everything together in the two minutes it took me to eat it. The fries were crinkle fries cooked brown and salted. Medium thick, they were good, but not unusual. The original location for the Shake Shack in the shadow of New York's Flatiron Building. The shake was fabulous. Creamy thick and cold, but still drinkable through the fat straw. The Chocolate quotient was perfectly balanced. I sensed a slight hint of coconut. If you get to New York, don't hesitate to give it a try. Try to get to the original location for a great experience. Madison Ave. and E 23rd St. 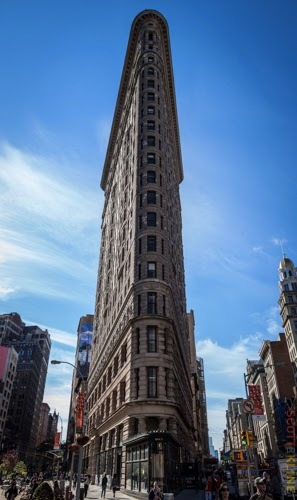 The Flatiron Building looms next door to Madison Square Park.